Chemical Structure of Bis(10-hydroxybenzo[h]quinolinato)beryllium (Bebq2); CAS No. 148896-39-3; Chemical Formula C26H16BeN2O2. Bis(10-hydroxybenzo[h]quinolinato)beryllium, known as Bebq2, is the brother of Bepp2 in the Beryllium complex family. It is also a blue-fluorescence emitter with excellent charge transport ability. When compared with Alq3 as an electron-transport material, Bebq2 was proven to be superior, even though the ionisation potential and optical band gap of Bebq2 (5.5 eV and 2.7 eV respectively) and Alq3 (5.6 eV and 2.8 eV respectively) are almost the same. The best use for Bebq2 is not as an emitting-layer material or a host material (even though it is a widely used host material), but as an electron-transport material . 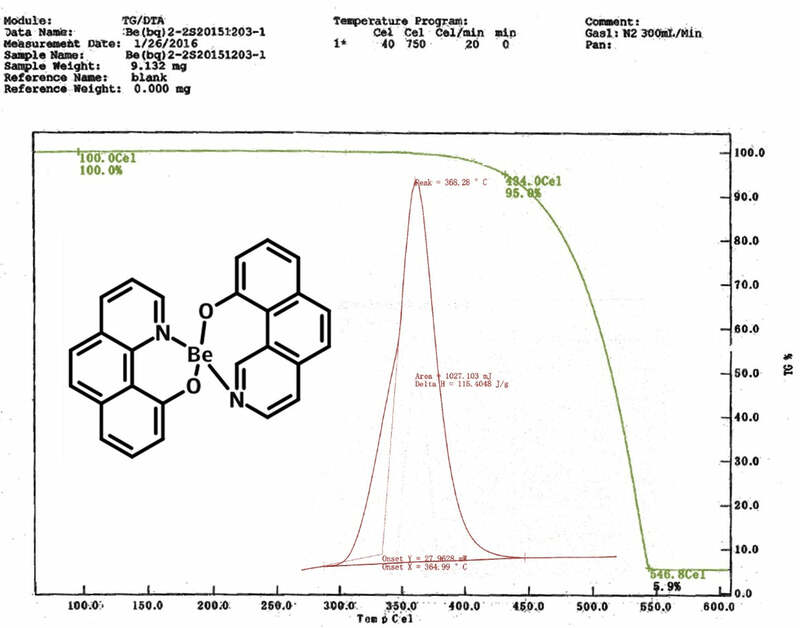 Thermogravimetric Analysis (TGA) and Differential Scanning Calorimetry (DSC) traces of Bis(10-hydroxybenzo[h]quinolinato)beryllium (Bebq2). Click on figure for full-size image. Influence of the Emission Site on the Running Durability of Organic Electroluminescent Devices, Y. Hamada et al., Jpn. J. Appl. Phys., 34, L824 (1995); http://iopscience.iop.org/1347-4065/34/7A/L824. Efficiency Control in Iridium Complex-Based Phosphorescent Light-Emitting Diodes, B. Diouf et al., Adv. Mater. Sci.&Eng., 2012, 794674 (2012); doi:10.1155/2012/794674. Highly Efficient Simple-Structure Red Phosphorescent OLEDs with an Extremely Low Doping Technology, W. S. Jeon et al., J. Info. Display, 10 (2), 87-91 (2009). Comprehensive Study on the Electron Transport Layer in Blue Flourescent Organic Light-Emitting Diodes, B. Liu et al.,ECS J. Solid Stat. Sci.& Tech., 2 (11) R258-R261 (2013). High efficiency red top-emitting micro-cavity organic light emitting diodes, M. Park et al., 22, (17), Optics Express, 19919 (2014), DOI:10.1364/OE.22.019919. J-H. Lee et al., J. Electrochem., Soc., 154, 7, J226-J228 (2007). Highly Efficient and Stable Red Phosphorescent Organic Light-Emitting Diodes Using Platinum Complexes, H. Fukagawa et al., Adv. Mater., 24, 5099–5103 (2012); DOI: 10.1002/adma.201202167.